In a career first, iconic Musician/TV/Film star, ICE-T, will appear on “The Howard Stern Show” as the featured “in-studio” guest this Wednesday, June 28th at 9AM EST. 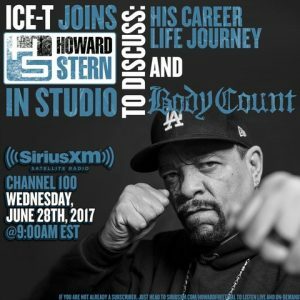 Be sure to tune-in then to SiriusXM’s Howard 100 channel to hear the incredible ICE-T life story, while spotlighting a few of the amazing new BODY COUNT Bloodlust album tracks throughout the course of the interview! Also, don’t miss BODY COUNT performing a full set at Chicago Open Air on July 15th. Visit chicagoopenair.com for more information.